Absolutely perfect vanilla cupcakes with vanilla frosting are super moist, buttery and melt in your mouth. Topped with silky smooth vanilla buttercream frosting – a classic combination! Cupcakes experienced a serious boon in popularity about 10 years ago and boutique cupcake shops started popping up in every neighborhood. Forget about traditional cupcake flavors; things like red velvet, mocha, salted caramel and peanut butter were all the rage. 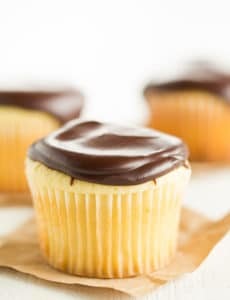 And as good as those cupcakes are (seriously, I love them ALL), is there anything more iconic or nostalgic that a simple vanilla or chocolate cupcake? 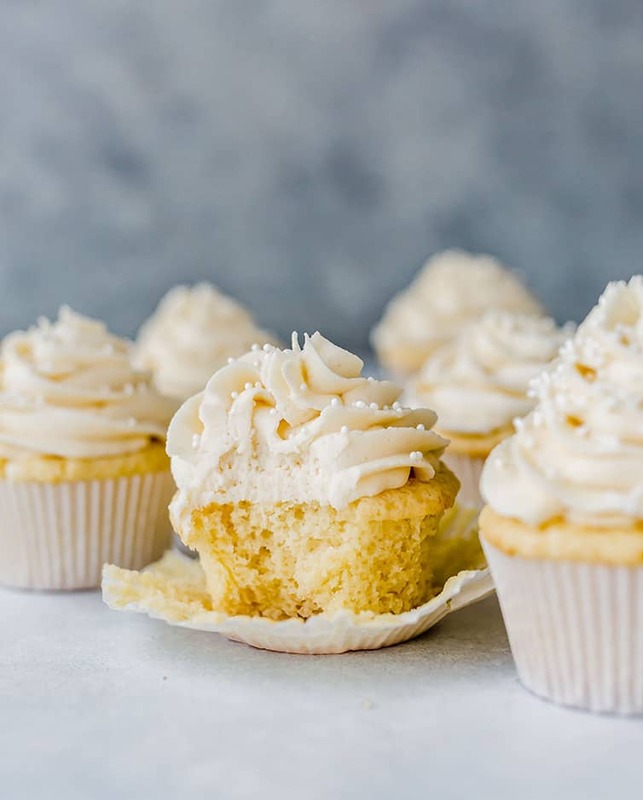 My husband will always choose a vanilla cupcake with vanilla frosting, so I set about finding the best combination of each a long time ago and fell in love with this recipe! 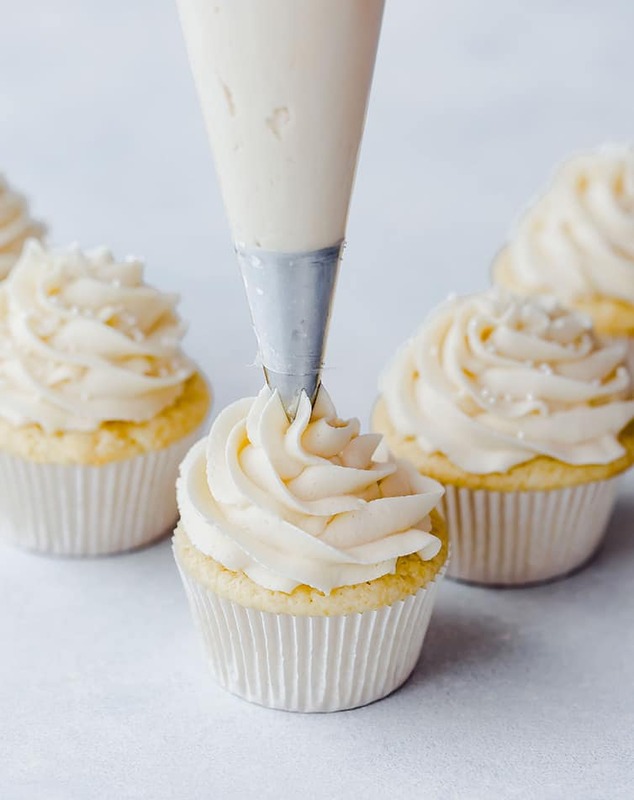 Perfect Vanilla Cupcakes with Vanilla Frosting! 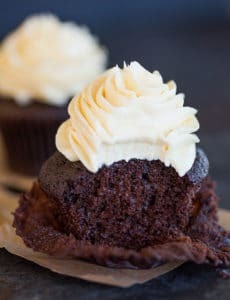 These cupcakes are extremely buttery, supremely moist, and totally melt in your mouth, plus they come together in absolutely no time at all, which make them a quick and easy weeknight or weekend project. 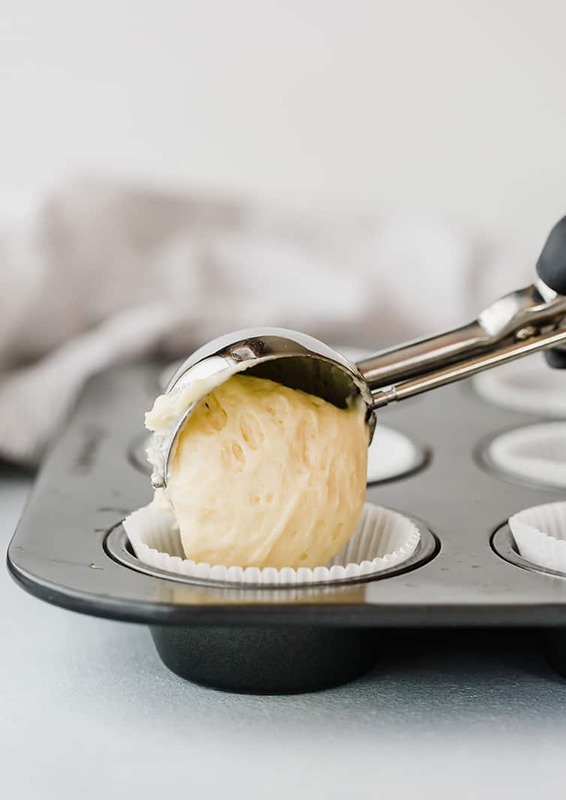 A lot of cupcake recipes use oil instead of butter to keep them moist, but for a vanilla cupcake, I much prefer the pronounced butter flavor which shines through so wonderfully. Why Are My Vanilla Cupcakes Dense, Crumbly and Taste Like Cornbread? One of the biggest complaints about homemade vanilla cupcakes is that they often turn out dense or (horror of horrors) taste like cornbread! So what gives? Why does this happen? How can you prevent it? 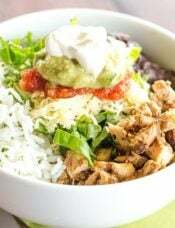 Make sure all ingredients are at room temperature. 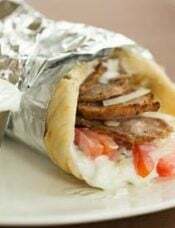 This is essential – be sure that the butter is FULLY softened and that the sour cream and eggs are also at room temperature. If the ingredients are not all at the same temperature, they will not incorporate properly or thoroughly, which can cause a dense cupcake. Do not overmix the batter. This goes for most baked goods! 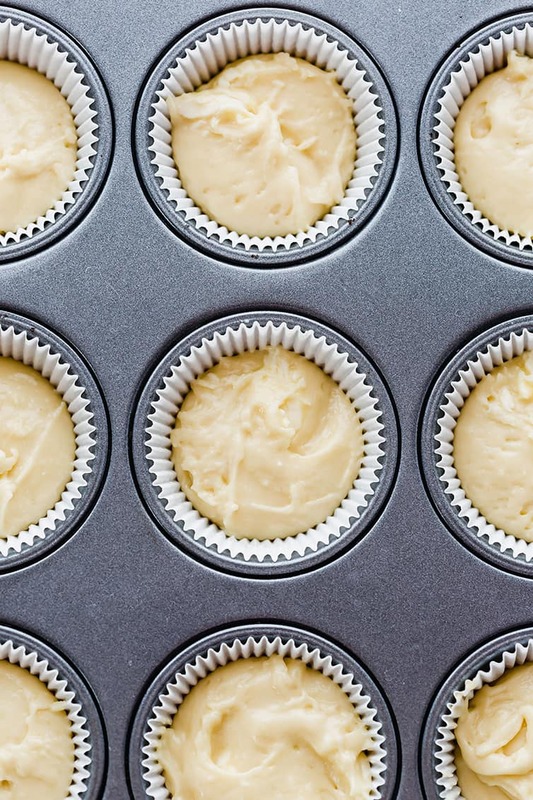 Overmixing can cause too much gluten to be developed, which can also cause dense cupcakes. 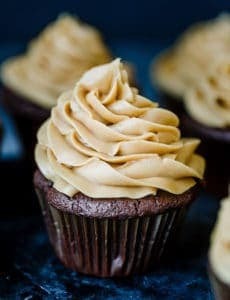 This is my absolute favorite frosting recipe, one that I began using a long time ago, and is the base for such things as my Espresso Buttercream Frosting (which made an appearance on top of the Mocha Cupcakes), Maple-Bacon Buttercream Frosting (which topped the Pancake Cupcakes), and The Best Chocolate Buttercream for Cupcakes. 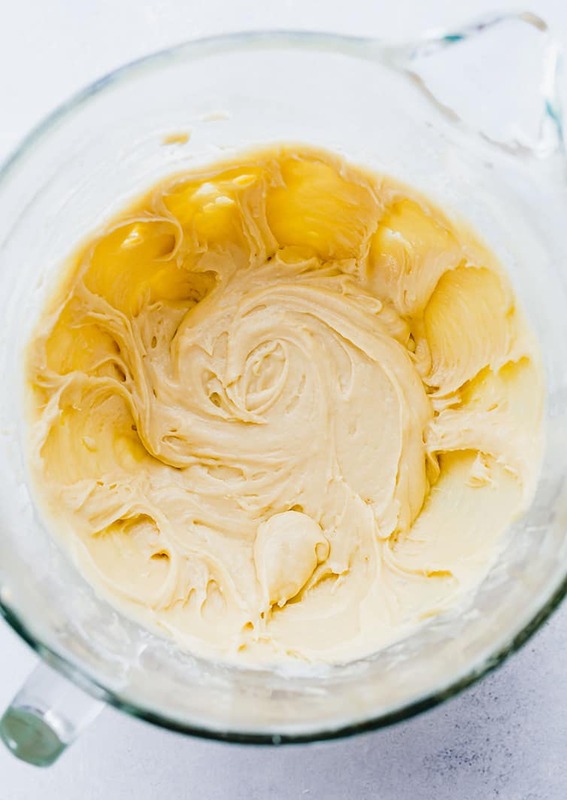 Needless to say, it is my go-to frosting recipe, and I hope it will become yours too! 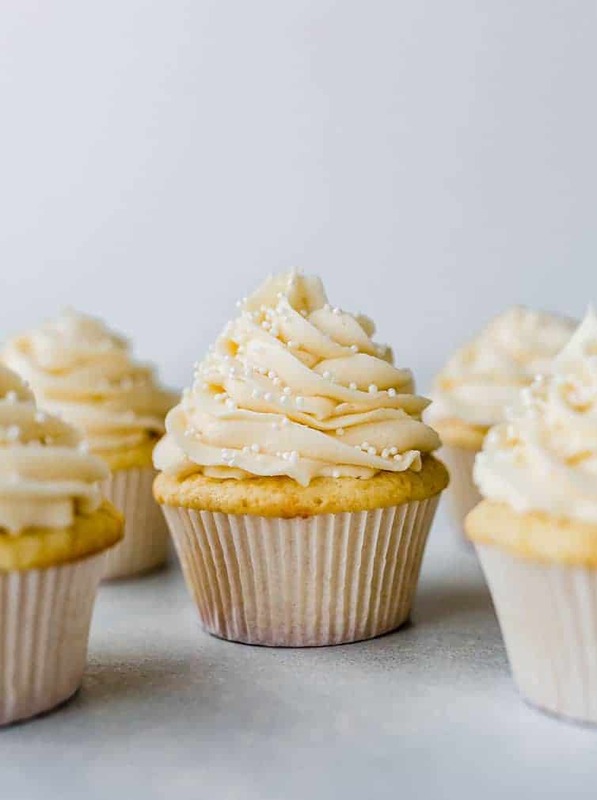 With all of those crazy cupcake flavors floating around today, a simple recipe for vanilla cupcakes and vanilla frosting is a must have for a baker of any experience level! 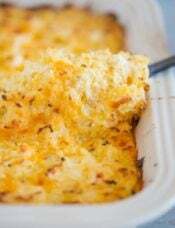 This recipe was originally published on October 28, 2010. I always come here for baking recipes. Unfortunately, these cupcakes missed the mark for me. They did end up very dense, even though I made sure to follow the recipe exactly. One friend commented that they had the consistency of cornbread muffins. 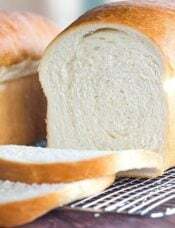 But the taste is wonderful and the butter flavor comes through well. The crumb just wasn’t what I like in a cupcake. Always get a lot of compliments on these cupcakes!! 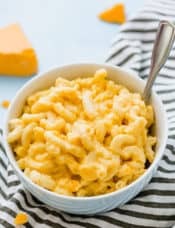 Love BEB but this recipe wasn’t my favorite. The crumb in the cupcake was too dense for me. I loved the frosting and will keep that for other recipes in the future. I think I was looking for something lighter -I should’ve known with all those yolks that it wasn’t going to be light enough. I made these today & was pleasantly surprised. The cupcakes came out light & moist. They didn’t deflate or were grainy. Will most definitely use this recipe again. I did the exact same recipe but I put in a cake pan and it took about 60 minutes. Was it the cake pan that made it longer to bake? Hi Adriana, Yes it will take longer in 9×13 than in round layers. Hi Laura, I think that frosting is always best fresh, but you CAN freeze it; let it thaw in the refrigerator overnight, then take it out and let it come to room temperature, give it a whip with the mixer (stand or hand, either is fine) or a strong whisk, and it’ll be ready to use. 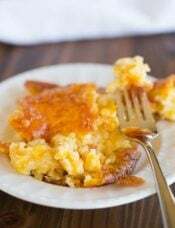 This recipe came out on the dry side for me— excellent buttery vanilla flavor, but really not the plush, moist yellow cake I was after. I wouldn’t go so far as to compare it to “cornbread” but I was disappointed. I followed all the instructions (using the weights), mixed it up by hand, and my resulting batter was quite thick— not smooth or satiny. They baked quickly— 20 minutes exactly (rotated the pan halfway through). The frosting recipe was easy and smooth. Overall, while I don’t think the cupcakes are unservable at a casual event, I’m still looking for a vanilla cake I can use for birthday parties.